Kathryn DeVane Hamilton has been selected as a Florida Super Lawyer - Top Family Law Attorney, a recognition only given to 5% of attorneys in Florida. Kathryn has previously been named a four time Florida Super Lawyers Rising Star - 2013, 2011, 2010, 2009. Rising Stars are the top young lawyers in Florida under 40. Only 2.5% of lawyers are honored with the distinction of Rising Star. 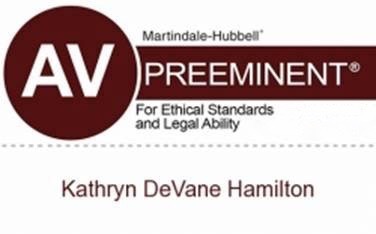 Kathryn DeVane Hamilton is rated AV Preeminent by Martindale Hubbell. An AV certification mark is a significant rating of accomplishment - a testament to the fact that Kathryn’s fellow peers rank her at the highest level of professional excellence for her legal abilities and ethical standards. She is rated to have a “High Ethical Standing” by fellow attorneys and an Overall Client Rating of 5.0 out of 5.0. Kathryn DeVane Hamilton has been rated as a "Superb" Top Attorney in Family Law by Avvo wherein she is rated as excellent by her peers and clients. Kathryn has been ranked as a Top Attorney and recognized for excellence in 2013 and 2011.